An accurate prediction of earthquake ground motion amplification in complex geological structures and its incorporation in the definition of seismic action in building codes is of paramount importance for engineering research, as many densely populated urban areas and strategic extended structures are built on soft sedimentary basins. Standard tools for this purpose rely typically on one-dimensional numerical approaches, under the assumption of horizontally layered soil structure and vertical propagation of seismic waves. However, such approaches may provide unsafe estimates, because they do not take into account the complex, 3D morphology of the basin, including resonance effects and basin-edge surface waves, and its coupling with seismic rupture propagation effects, such as source directivity, polarization of motion, which may be relevant in near-source conditions. In this context, the Mygdonian basin (EUROSEISTEST and EUROPROTEAS facility), located about 30 km NorthEast of the city of Thessaloniki (Northern Greece), represents an ideal case study to test and validate different approaches for site effects estimation. 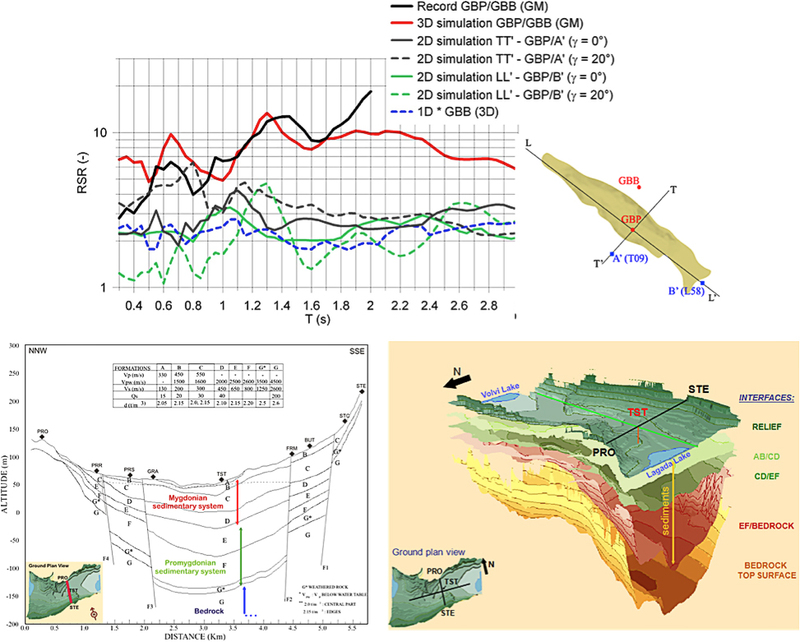 The availability of detailed 1D, 2D and 3D soil models for the Mygdonian valley basin together with the information regarding site response from earthquake and noise recordings allows us to achieve the following key objectives: (i) 3D numerical modelling of seismic response of Mygdonian basin including the extended seismic source responsible of the historical 1978 earthquake; (ii) evaluation of 3D site amplification functions within the basin and comparison with the experimental ones; (iii) comparison between 3D, 2D and 1D approaches for estimation of site effects in the basin; (iv) definition of suitable 2D/3D aggravation factors to incorporate complex site effects in a design elastic spectrum.